Powerful oil for anxiety, respiratory and digestive issues. Angelica Root Essential Oil is also known as the Holy Ghost or Holy Spirit Root, Archangel Root and Oil of Angels. This oil probably got its name because its healing powers were so great and vast that the origin must have been from a Divine Source. Traditionally, Angelica Root Essential Oil has been considered an effective tonic for the digestive system due to its carminative & cholagogue properties. It is recommended for flatulence, gastritis, and stomach ulcers. It can also be effective when dealing with hiccough and anorexia. This essential oil is also beneficial for the respiratory system. It is a mild expectorant with anti infectious qualities which makes it an effective inhalant for chronic bronchitis, asthma, the flu, pneumonia, sinus infections, and coughs. 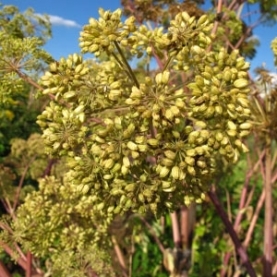 In China, Angelica Root is known as the “female Ginseng”. It is used for “women’s troubles” relating to menstruation and menopause and to help with problems of the heart and circulation. Angelica is considered to be a very powerful lymph and blood purifier. Because of its ability to reduce excess uric acid levels in the blood, is a valuable remedy for the relief of gout, rheumatism and some forms of arthritis. Angelica Root Essential Oil has been known to rebuild strength after any condition that depletes the body's energy. It can be useful in convalescence after chronic illness and to strengthen the emotional body. Angelica Root’s effect on the psychological body is one of revitalization and restoration… alleviating feelings of hopelessness. It is ideal for fatigue and stress related disorders. Angelica grows to 6ft fall. Its leaves are composed of small leaflets. The flowers blossom in July, are yellow or green in color, with umbels, bearing pale yellow fruits. Angelica grows in damp soil, preferably near rivers or deposits of water. Angelica Root helps connect us with our Divine Femininity. This essential oil helps remove old, false limiting beliefs that we may hold that bind us. When we are looking for an essential oil to help us feel more free and open energetically and spiritually, Angelica Root will open the temple doors for us. Energetically, this essential oil assists the user to be open to the angelic realm, source energy and higher self. We have found this essential oil very useful when one is feeling blocked or cut off from their higher self, guides or higher information. Angelica Root essential oil is very effective when working with the Root (1st chakra) , which deals with survival, living on the planet and grounding, Heart (4th chakra), which deals with love for self and love for the Divine, Brow (6th chakra), which deals with spiritual gift of seeing as well as how we see ourselves and how we see the world, and the Crown (7th chakra), which deals with our higher information and connection to the Divine. Angelica Root Essential Oil is steam distilled from the dried roots of the Angelica plant. Essential oils that come from the roots are good for grounding and support. These essential oils have an earthy aroma, and are reminiscent of the essence and stillness of ancient forests. Angelica Root is a wonderful essential oil for times of high anxiety, fear, depression and instability. We have also found Angelica Essential OIl to have a protective quality about it. The fragrance of Angelica essential oil may help release negative feelings from traumatic events. Angelica is phototoxic because of the furcoumarins present in the oil. Furocoumarins are photosensitizers, causing development of irregular pigmentation and potential burning if the skin is exposed to the sun within a few hours after use. Even when appearing in small amounts, furocumarins can have this effect. Angelica exhibits spasmolytic, anti-inflammatory, antibacterial & antifungal activity due to the a-pinene (26%) present in the oil. The 17.4% delta-3-carene brings mucolytic & anti-inflammatory properties to the oil as well. Blend in 1 ounce of lotion and apply to soles of the feet before bedtime. According to Tisserand & Young, Angelica Root is strong phototoxic essential oil. Avoid any sun exposure for 12 hours. Please do a test patch; can be skin irritating. Due to Angelica essential oil's high monoterpene content, it is recommended that oxidation be avoided by storing in a dark, air tight container in a refrigerator. Battaglia S. The Complete Guide to Aromatherapy. 2nd ed. Australia: The International Centre of Holistic Aromatherapy; 2003. Davis P. Aromatherapy an A-Z. New revised edition. England: C.W. Daniel Company Limited; 1999.